Read It! Wounds To Bind by Jerry Burgan AND: Found! We Five’s You Were On My Mind LP | Brad's All Vinyl Finds! 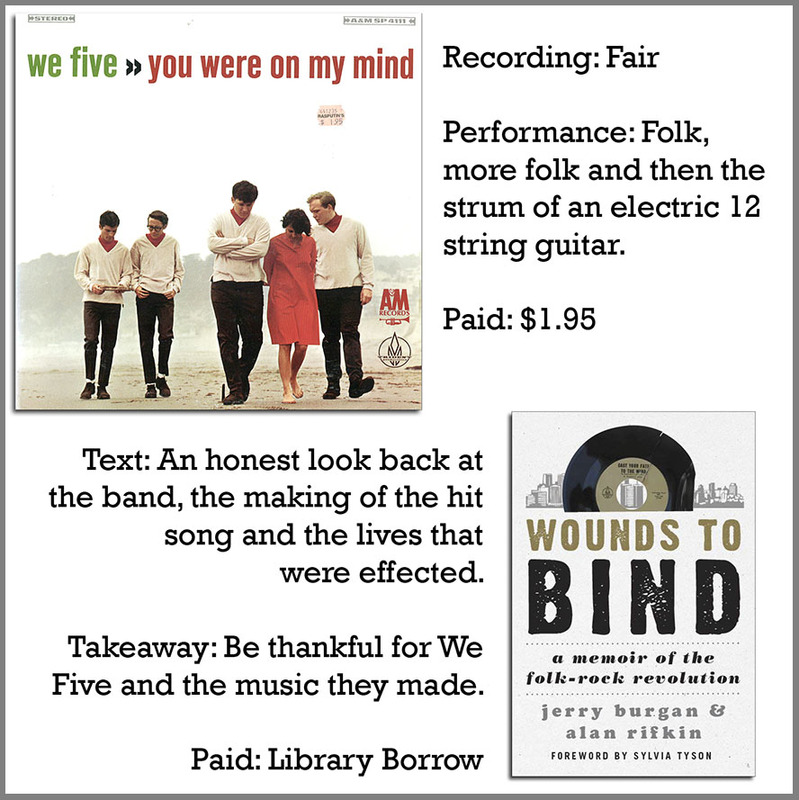 Most of the music biographies I read are about musicians who have passed onto the great beyond, but that’s not the case in Wounds To Bind: A Memoir of the Folk-Rock Revolution by Jerry Burgan (with Alan Rifkin). While some of the members of the band have died, Jerry is very much alive, as is the band’s lead singer, the elusive Bev Bivens. What band, you ask? In 1965, We Five was near the top of the charts, with a great tune, You Were On My Mind (Trident T-108 and A&M SP 4111*, stereo & SP 111, mono). I’d rate it among the best songs of the 60s. The band had a few other minor hits, but nothing else like this. The book is more than just a retelling of the travails of the road, although Burgan does a fine job with that. It’s a bit of a history of the folk-rock revolution through the eyes of someone who was smack in the middle of it, even if he didn’t know it at the time. There was no guideline for Burgan or the band, no one who could explain what was really going on around them or how their futures were being set. 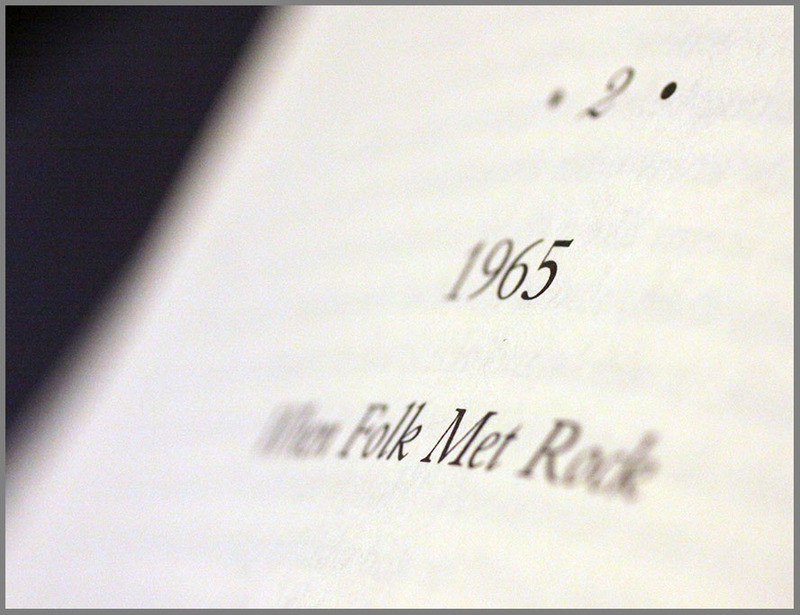 I’d never really thought about the details surrounding the beginnings of folk-rock music. I took it for granted. It happened and some great music was made. It’s compelling reading to digest those details and more importantly, how lives were effected, often in negative ways. But throughout all of it is the song. Biven’s voice starts out rather quietly, then there is the signature strum of the folk-rock revolution, the electric 12 string guitar. ** That strum differentiates You Were On My Mind from virtually every other song on the record and from just about every other song on the radio in 1965, too. Folk-rock was about to begin. Burgan goes over every lyric in the tune and describes the details that went into those lyrics and the way Biven’s sings them. It’s far more insightful than any description of a song I’ve ever read on the back of a LP by some critic. “It has one of the most roof blowing finales in the history of popular music,” Burgan writes, and I happen to agree. He describes how singing the song took everything they had. The released version of You Were On My Mind is take 13, with an earlier take of the shout-out-loud ending vocals spliced on from an earlier, less fatigued take. That knowledge makes me appreciate the vocal talents of the band and what it took to make their record. Today’s bands can multitrack and digitize their way to an essentially perfect song. But in 1965, We Five keep singing it until they exhausted themselves. They performed. The song ends on a harmonic high note and the lyric that for me, causes the song to stand out: Wounds to biiiiiiind! …and cue the jingle jangle 12 string guitar ending. How the heck does any song end on that line? No love, no peace? Nope. 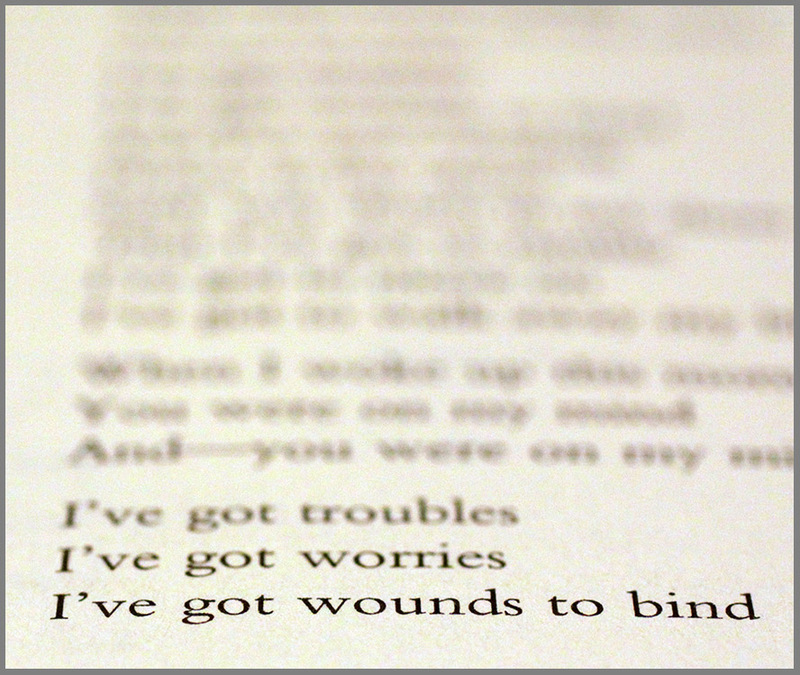 I’ve got wounds to bind. Jeez, the tune bounces its way right into your brain but lyrically isn’t what you’d expect. Still, there’s a hopefulness about it all and that’s probably why it succeeds. Even if the band changed a few of Sylvia Fricker’s original 1962 lyrics. Sylvia Fricker (Tyson) isn’t a name I’d expect you to recognize, but you might know her as half of the Canadian folk duo Ian & Sylvia. Per the book’s forward, written by Fricker, she’d met a rather young Bob Dylan and was impressed that he was writing his own songs, so why couldn’t she? Her first tune was You Were On My Mind! If you aren’t sure what the folk-rock transition was about, compare Fricker’s original version, recorded in 1964 (for the LP, Northern Journey, Vanguard VSD 79154) and We Five’s. Interestingly, Fricker plays an autoharp on the song, which almost sounds like a 12 string guitar masquerading as a harpsichord. And her tune sits squarely in the folk vein. Put on We Five and the difference, the moment is right there, coming out of your speakers. 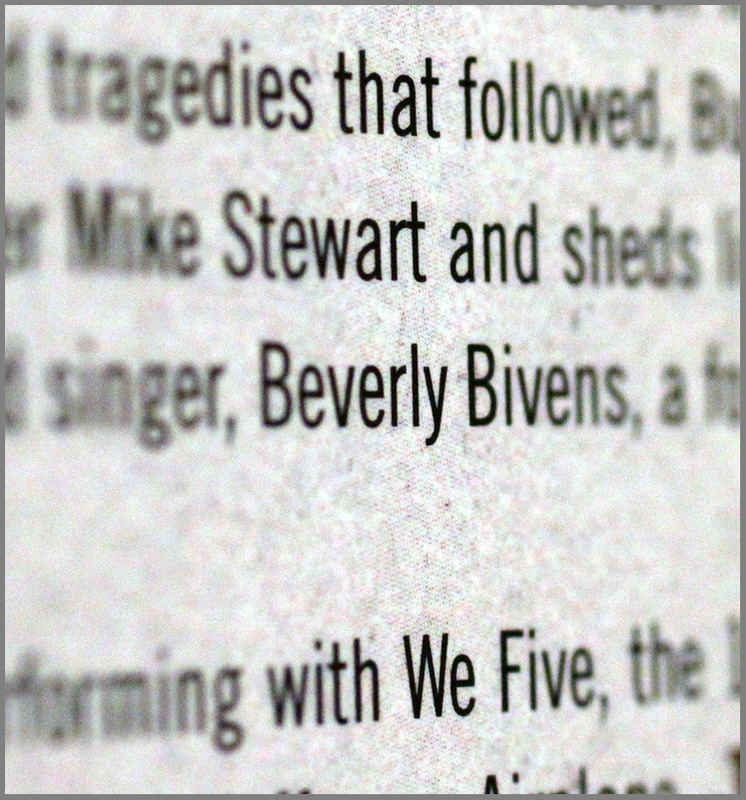 Like many of the bands from this era, I wondered what happened to the members, especially Bivens. There are a few things online about her, but no huge biography, no long list of other bands she sang with. That’s because according to Burgan, she quit singing commercially in 1968, much to the chagrin of us fans who would love to hear more of her. 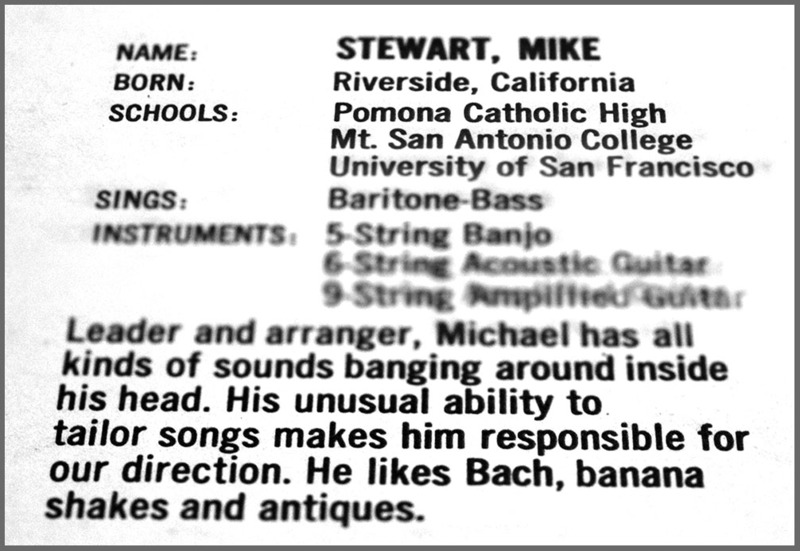 And I didn’t know that the man who Burgan credits with being the real creative genius of the band was Mike Stewart. Uh, who? Stewart’s older brother was John Stewart, of the Kingston Trio. OK, that Mike Stewart. He struggled as John’s younger brother his entire life. Much of the book is devoted to Mike, who was Burgan’s best friend. I didn’t buy the vinyl LP back in 1965. I probably didn’t hear it on the radio until the late 60s, maybe even the early 70s. 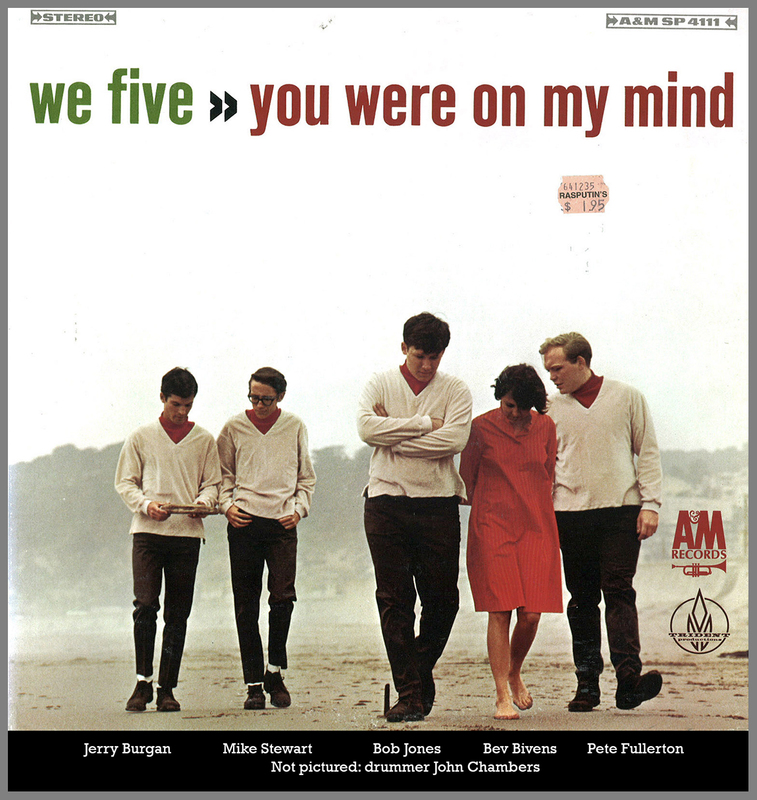 I might have sought it out, but We Five had no other hits playing on Fresno’s AM radio station, KYNO…so I didn’t think too much about finding their record. I found it in the dollar bins about 10-12 years ago, I think. I was immediately impressed at the tunefulness of every song. I liked nearly every cut on the LP. There is but one Mike Stewart original (co-written with brother John Stewart), two more by John, and the remaining 9 songs are covers, so if all you did was read the song list, you might think it was a jazz record. Jazz bands have covered most of the songs on the LP. But this is a folk record, trying, crawling, inching its way toward the sound of the mod-pop-rock 60s. The rest of the songs? They’re terrific, especially if you enjoy the sound of the 60s folk revival and how bands from this era performed them. Mike Stewart’s arrangements and the band’s vocal harmonies take center stage. You can really listen to this band and hear a great song, being sung greatly. The band takes a standard like Somewhere Beyond The Sea, which I first heard as a brassy jazz tune by Bobby Darin, and simplifies it, acoustic guitar (and banjo) strums it and turns it into a whole new song. The rhythm of the tune seems to change in the middle of the song in a way that I can’t describe, but it moves better for it. Softly As I Leave You. Frank Sinatra sang it, so did Eydie Gorme, even Elvis Presley. Burgan and the band finger pick their way to a modern, folk styled but still utterly romantic song with sweet harmonies throughout. Tasty finger-picking guitar work and you get the chance to hear just the guys harmonize without Bivens, too. You’ve probably heard Elvis Presley’s I Can’t Help Falling In Love With You. We Five, as is their wont, take the Pelvis’ glorious version and make it folky in a faster paced, guitar oriented way. They even change up the chords a bit, as the tune takes a minor turn during the chorus. I really like this change of pace and the underlying chord structure. A briskly strummed acoustic guitar picks up the pace with Our Day Will Come, the hit for Ruby and the Romantics. That guitar, the lightly brushed drums and some well chosen single notes played on a second guitar won’t remind you of the original, in part because Mike Stewart (I presume, but it could have been the band) changed up some chords again. If you enjoy show tunes, give My Favorite Things a listen. I love the John Coltrane jazz version. This one opens with some cool guitar string harmonics. It comes across less like folk and more like a Christmas carol until halfway through and the guitar comes back in. It’s beautifully sung. My vinyl record was $1.95 beat. I’d say the recording quality is ok…I wish it were better, but them’s the 60s and the beginning of overdubbing. The CD (on Collector’s Choice) is smoother and less compressed. It’s a two-fer, with the band’s excellent second LP, Make Someone Happy included (and it’s your last chance to hear Bivens with the band). The really wonderful thing you can do is listen to the record and read the book. Connect the dots in ways that you never could have. As much as I loved the record before, I appreciate it even more now. I appreciate the musicians who slaved their way through an insane time in our history. You can’t help but feel more connected to the songs and the band after reading Burgan. He’s quite clear about his personal faults and failures, and how that played into the band’s history. After reading the book, I realized what amazing people created this music. Love and anger, peace and war. The musical coin has many sides to it and when we are fortunate, great, if momentary things can happen. Like the making of this record, which led to the writing of Burgan’s book. Mike Stewart, the visionary force of the band, died after a long and successful career in computing. It’s damned shame that he isn’t better known, for once you pay attention to his arrangements, you realize how talented he was. Drummer John Chambers, the sixth (and unknown) member of We Five, is also gone. As the black drummer**** of the band, his story gives further context to the time period. The band’s manager, Frank Werber, died in 2007. His inability to rapidly change with the rapidly changing times heavily influenced the Kingston Trio (successfully) and We Five (not so much). Looking back, it’s easy to see how the band’s first LP represents a special moment in music. 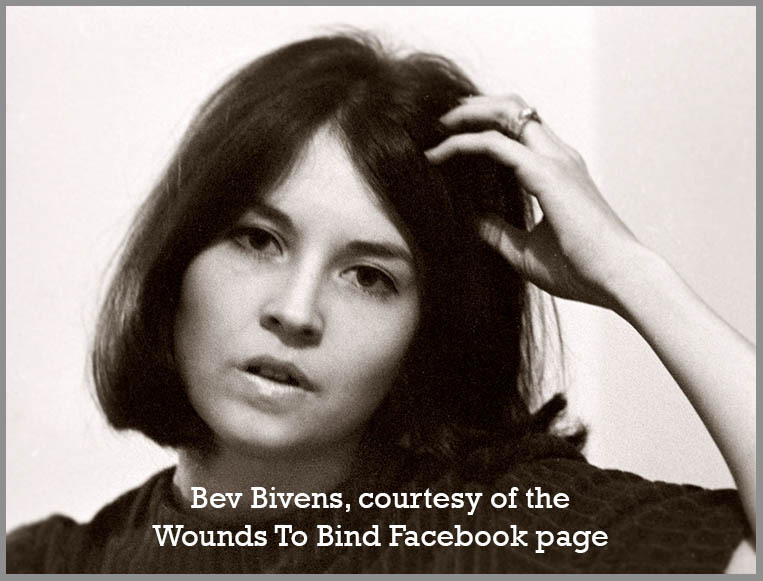 It’s 60s folky, folky-broadway, folky-acoustic…and then there are drums, bass, an electric 12 string guitar and the voice that launched a thousand fan-boy ships, Bev Bivens. If you like the sound of the 60s, or have wounds to bind, I can’t recommend the LP and the book more. – lyrics from Mike Stewart’s song, If I Were Alone, sung by Bev Bivens. Want to hear what all the fuss is about? Here’s a brief medley of tunes direct from my $1.95 LP, plus a comparison of the We Five version of You Were On My Mind vs Sylvia Fricker’s original (from the Northern Journey LP)! If you aren’t sure what the move to folk rock was about, the comparison will clear it up for you immediately! Fricker’s song is squarely folk (and still cool), and We Five’s rocks! We Five went onto to record more LPs, but without Bivens. Jerry Burgan’s wife-to-be, Debbie Graf takes over on their third LP and in my opinion, does a fine job. No, she isn’t Bivens, but if you give Graf a chance, I think you’ll like her, I do. The Return of We Five is worth seeking out and I can highly recommend it. It just took me awhile to get used to a different voice. I also think the audio quality of Return is better. * Oddly, the run out groove numbers on my LP are SP 4121 (A side) and SP 4122 (B side), not SP4111, so I presume my LP is a later pressing of some sort. Maybe if I had an earlier pressing the sound quality would be better. ** One of the more interesting things in the book is Burgan’s description of how a second 12 string guitar was added to the song after the band recorded it, for better or for worse… by another guitarist not associated with We Five. *** In 2009, Bivens returned to the stage in San Francisco to sing at a San Francisco museum exhibit. A local news channel covered the event and here’s a link to a vid. **** Wanna watch the band perform live? Here’s an interesting tidbit from pages 88-89 Burgan’s book…this video opens with a silhouette of drummer John Chambers because…he was black, and he would not be clearly shown on television because of it. Also note that Burgan is playing an acoustic guitar with an electric pickup installed. Sure looks like a Gibson J-160, the same guitar John Lennon was using. Bob Jones is playing a Rickenbacker electric 12, similar to the guitar used by the Byrds for their hit, Mr. Tambourine Man, which hit the airwaves a few months before You Were On My Mind did.